Our logistic centres meet the highest quality standards and are strategically set up in the most convenient locations in the region. Our developed distribution network allows companies to transport products across the Baltic and rest of the Europe. 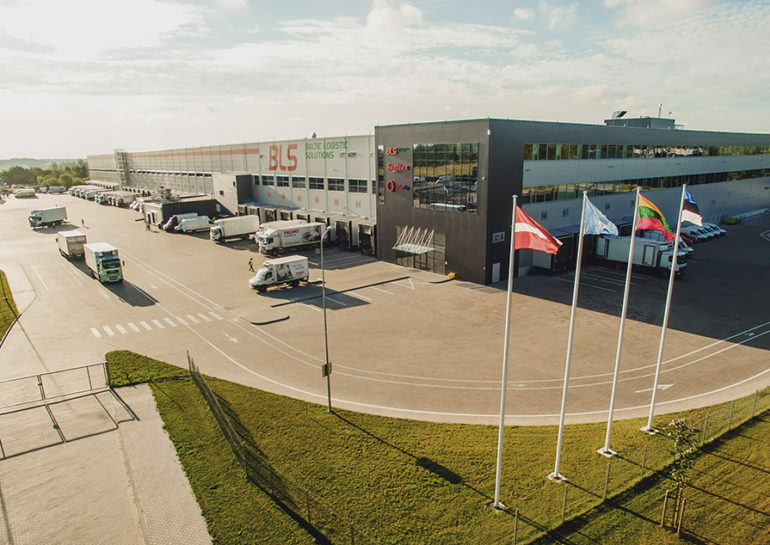 We are one of the largest logistics companies in the Baltic States, with more than 89 000 m2 of warehouse space. The company employs 1,150 personnel. Continuous storage processes 24 hours a day, 100% adaptation to customer needs. Experienced and professional staff members ensure high quality and efficient logistics solutions. Going hand-in-hand with the growing needs of our customers, we apply modern process management technology, storage technology, and a new car fleet. With increasing efficiency of processes, we save our costs and our clients` funds. 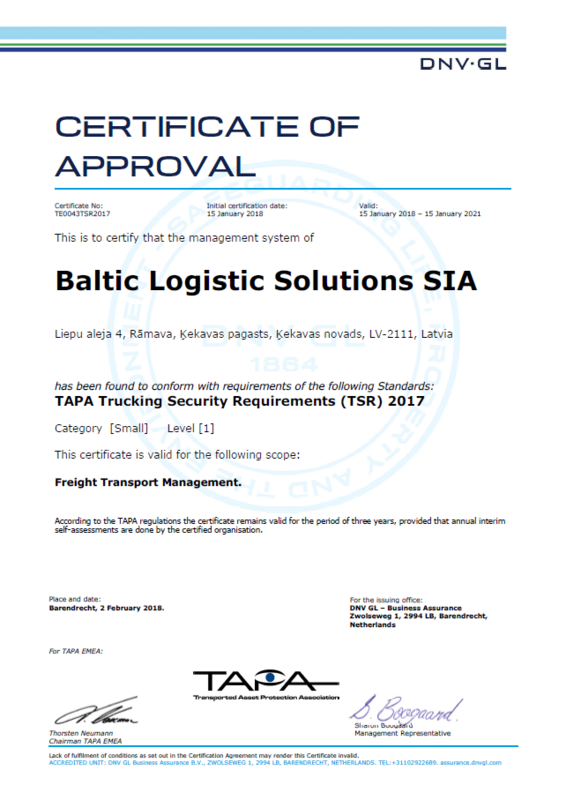 Baltic Logistic Solutions is a certified TAPA – 1 carrier. The Transported Asset Protection Association (TAPA) is a unique forum that brings together global manufacturers, logistics service providers, freight forwarders, law enforcement authorities and other stakeholders. The general objective of this forum is to reduce the loss of international supply chains. Vehicles are equipped with special security equipment and monitored 24/7. 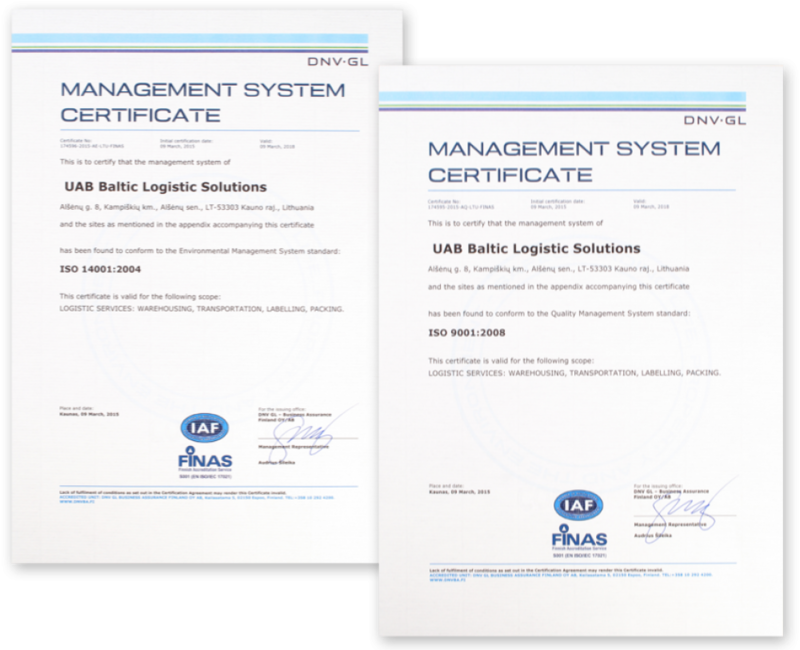 UAB Baltic Logistic Solutions has implemented a certified and continuously reviewed integrated quality and environmental management system – logistics services in place: storage, transportation, labelling, packaging. This system meets the requirements of international standards LST EN ISO 9001:2015 and LST EN ISO 14000:2015. Product safety is based on the Hazard Analysis and Critical Control Point (HACCP) system. The company employs experienced and professional staff. Compliance with the highest environmental standards throughout the logistics chain. Quality and environmental management systems are improved in the light of changes in the company and the environment.